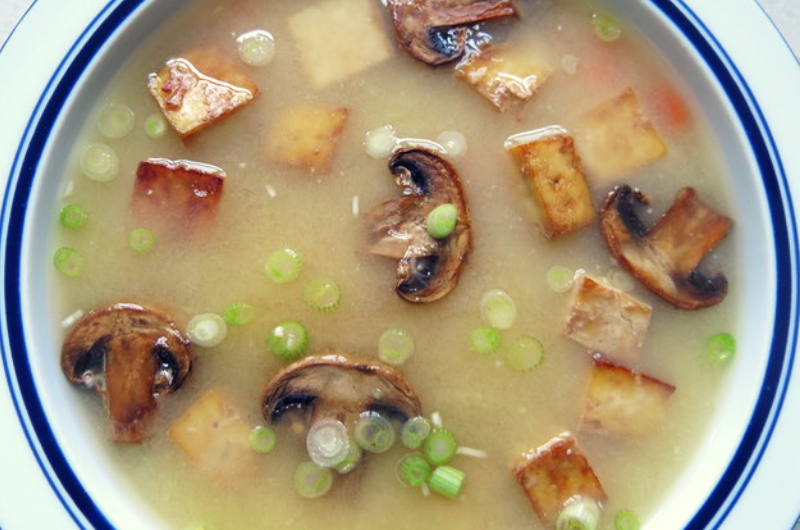 Who doesn’t love a warm bowl of savory miso soup? While most soup recipes require lots of chopping and simmering, miso soup can come together in minutes. Stick to the recipe for a simple appetizer, or add in rice noodles and seasonal greens, like kale and broccoli, to make a filling entrée. Enjoy my take on a family favorite! *Note that this recipe can be made without soy! Chickpea miso paste is now available at most health food stores, and the tofu can be omitted or swapped with a can of drained chickpeas. First, mix together all ingredients for the tofu in a large bowl and allow to sit for a few minutes. In a separate bowl, do the same for the mushrooms. Marinating both the mushrooms and tofu before roasted allows them to soak up the sweet and savory flavor of the coconut aminos. Meanwhile, preheat your oven to 350 degrees. After the tofu and mushrooms have marinated for about 10 minutes, place them on a lined or greased cookie sheet and roast for 20 minutes. If some of the liquid has not been absorbed, try to not pour it onto the cookie sheet as it can burn. While the tofu and mushrooms are roasting, cut the carrots. In a large saucepan, add the water, carrots, hunk of ginger, and the dark green portions of the green onions (these will be removed later, make the pieces large so the can be easily scooped out). Boil until the carrots begin to become tender. Once the carrots are tender, turn off the heat and remove the hunk of ginger as well as the dark green portions of the green onions. In a separate small bowl, whisk together the miso paste with a few tablespoons of water to form a loose paste. Mix in the miso paste mixture into the saucepan then add the roasted tofu, mushrooms, thinly sliced light colored portions of the green onions, and any other items like cooked rice noodles or steamed kale. Serve the soup as is or add a dash of sesame oil or sesame seeds to each bowl. 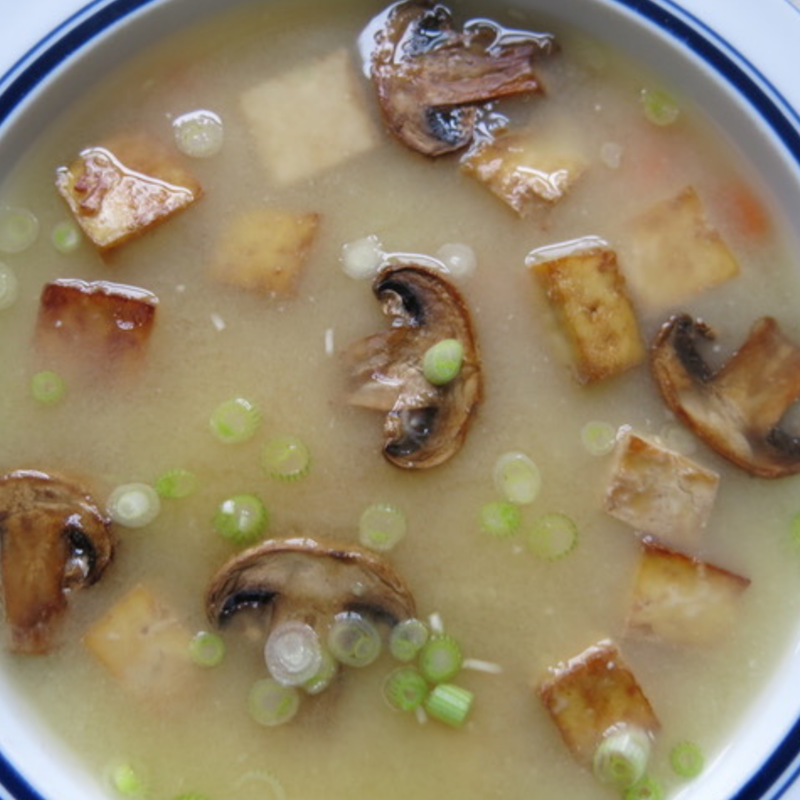 Enjoy this comforting bowl of healthy miso soup!